Using a combination of Healing brushes and Stamp tools to patch hair gaps, existing makeup or skin textures. Using Frequency Separation with Mixer Brush and regular paint brushes to adjust skin tone and color. 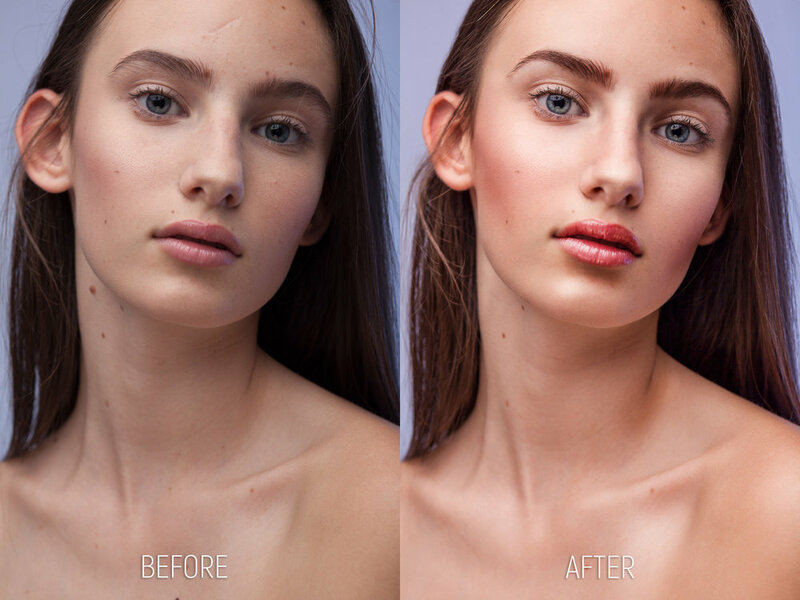 Enhancing or changing makeup and eye color using adjustment layers on different blending modes with masks and layer styles. Using Displacement maps for different makeup changes or additions. Using Liquify to emphasize or correct certain physical features. 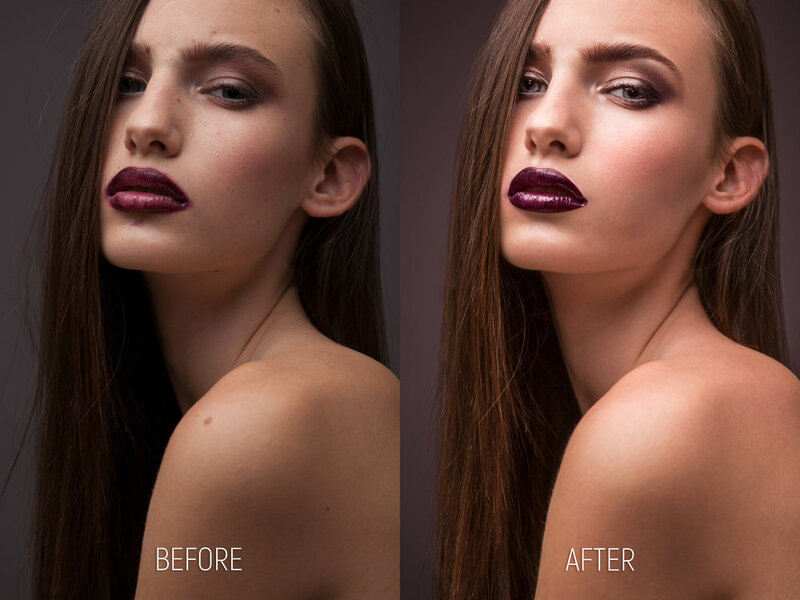 Using focus and luminosity masks to change the background or adding special effects filters. Using High Pass filters to sharpen parts of the image. Brightness, contrast and color correction. Scar, hair patches and some birthmarks removed, eyebrows thinned. Used Liquify to make ears smaller, the nasal bone more narrow, fuller lips and narrow the jawline. Increase brightness of eyes, added blue and green to saturate and make the irides pop-up a bit more, made the eyelashes thicker and fuller by making them darker. Changed lip color and saturation to give the lips more of a glossy look. Matched overall skin color (frequency separation), used dodge and burn to give the portrait more volume and contrast, patched other imperfections and added sharpness on a few facial features using High Pass filter and masks. Brightness, contrast and color correction. Hair fringes and coat folds removed, eyebrows thinned. Skin color match, changed color and saturation of the lips, darkened eye makeup, brightened and increased saturation/color on eye, made the eyebrow look fuller in accordance with today’s makeup trends. Used Liquify to give her nose a more curved aspect, and her hair more volume and an uniform aspect at the roots. Used Levels adjustments to dodge and burn for volume, and Highpass filter to sharpen. Added texture and color to the background to make the portrait pop up. Brightness, contrast and color correction. Removed skin bumps and fallen pieces of glitter, softened shadows on skin, matched skin color, thinned and contoured eyebrow, gave the background a more uniform and dark look. Changed eye color and brightened it, changed lip color, corrected the original eye makeup and added wing-like extensions to the eye makeup using a displacement map. Dodged and burned the portrait for more volume and contrast and used a High Pass filter to sharpen parts of the image. Brightness, contrast, color and lens correction. Removed distracting objects and shapes in the background, re-centered image, removed clothing folds. Recovered/added skin texture and portrait volume, thinned eyebrows and made them symmetrical. Changed lips color and sharpened them, brightened eyes and added more vibrance to the irides, added longer eyelashes and subtle eye makeup color. 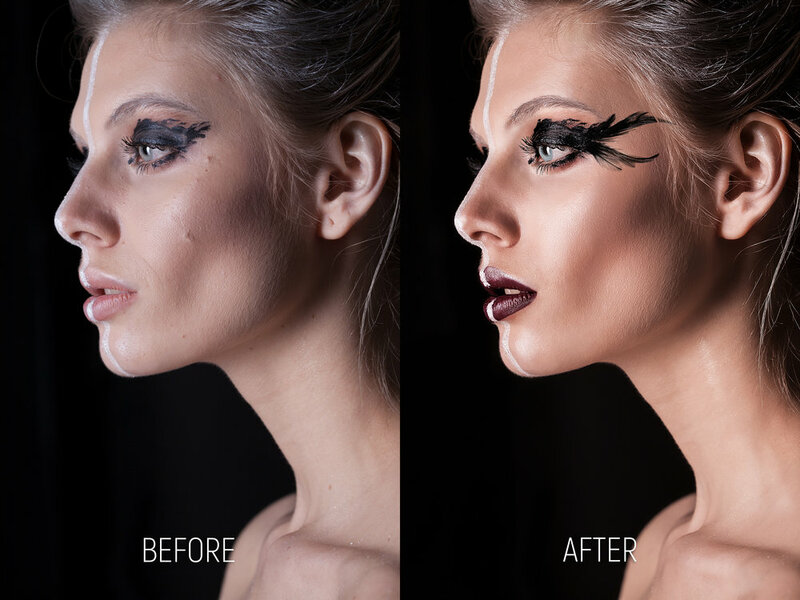 Used Liquify to make her jawline narrower and added a Gradient Map to give highlights and shadows complementary hues. Brightness, contrast, color correction. Cleared skin blemishes, hair strings and patched the lower right side of the image to be covered entirely with the curtain. Removed redness in her eyes, brightened them and changed their color and saturation. Brightened her lips to emphasize the frozen makeup effect. Enhanced makeup and added a frozen water bubble effect using a displacement map. Removed warm colors from highlights and white objects in the image. Brightness, contrast, color correction. Straightened lower teeth, repaired large tooth on the upper right part and the chipped one next to it. Adjusted the apple’s shape. Removed black lipstick stains from the tongue and teeth using composited textures. Color and brightness corrected teeth. Removed skin blemishes around the mouth, contour lips and made them look more glossy. Brightness, contrast and color correction. Scar, hair strings, birthmarks, freckles, skin bumps removed and eyebrows thinned. Removed lipstick smudges around her mouth. Equalized and colorized the lips, emphasizing their glossiness. Brightened and added more color to her eyes, darkened the skin around the corners of her eyes to complement and emphasize her existent makeup. Contoured the eyebrow shape, matched the skin color by painting with pink, dodged and burned using white and black paint brush on a 50% gray layer in Overlay blending mode. Used Liquify to make the ear smaller and her nose more curved. Added sharpness on a few facial features using High Pass filter and masks. Changed background color and luminosity to match her lipstick. Brightness, contrast and color correction. Straightened and centered teeth, brightened and matched skin color, added more hair on the upper left side to give the portrait a more symmetrical look. 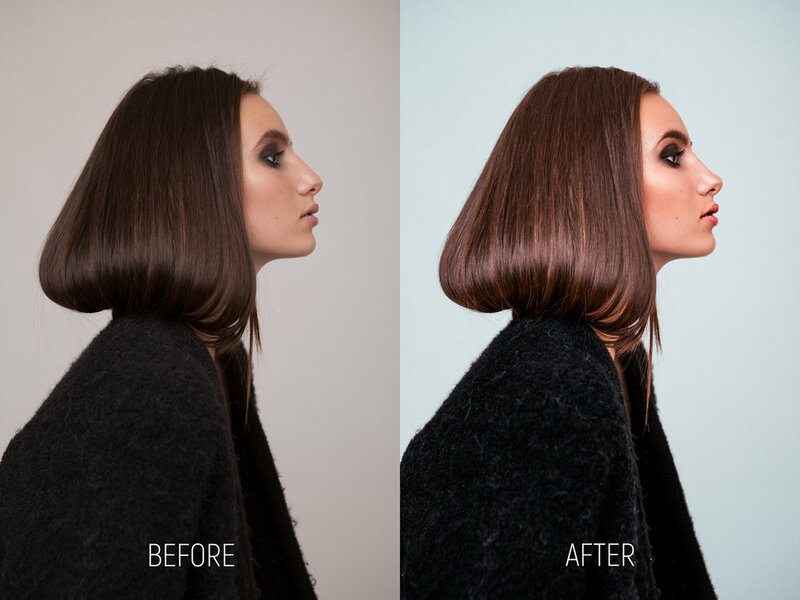 Used Liquify to give more volume to the upper part of her hair and to make her jaws symmetrical. Centered the portrait so the top of her head won’t be too close to the upper end of the frame. Increased contrast and color in her eyes, changed her lipstick color, added fake eyelashes, eyeliner and stronger eye makeup color to match her lips. Used a displacement map for the new digital makeup look. Changed background hue using a Curves adjustment layer with mask, added sharpness using High Pass filter. Brightness, contrast and color correction. Removed skin blemishes, corrected chapped lips, removed wrinkles, softened and matched skin color. Added more hair on her eyebrow using existing hair patterns and using a small brush with the Bevel and Emboss layer style. Contoured her eyebrow, brightened her eyes, added makeup on her upper eyelids using a displacement map. Changed lip color and made it uniform and used dodge and burn for more contrast and portrait volume. Brightness, contrast, color correction. Removed skin blemishes, hair strings and the hair clip. Desaturated and gave the background a winter look. Added frozen effects on her hair and face; added mist and steam using special effects brushes. Brightness, contrast, color correction. Extracted subject using Pen tool and refined the selection using Select and Mask, changed background. Removed skin blemishes, matched skin color, adjusted light direction, color intensity and saturation on jacket, t-shirt and hair. Brightened eyes, used dodge and burn to emphasize facial features, used High Pass filter to sharpen subject. Using the Guided feature from the Transform Tool in Adobe Camera Raw to straighten and perspective correct larger portions of the frame. Straightening different objects individually, depending on the lens’ distortion and characteristics. Removing or replacing distracting objects, lights, reflections and skies. Manually color correcting details and elements in the picture (e.g. roof color and tiling, wood textures, chromatic aberrations and lens flares). Saturation, clarity, contrast or brightness adjustments using adjustment layers on different blending modes with luminosity masks obtained from Channels. Adding, compositing, reframing using both existing assets or made-up tricks. Using special effects brushes to give sceneries more depth of field or a mystical feel. 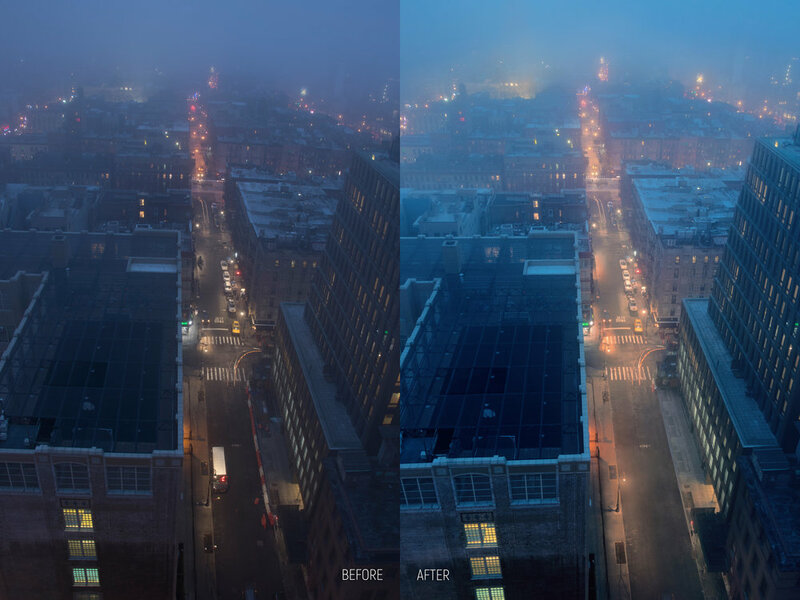 Brightness, white balance, contrast, color, perspective and lens correction. Removed poles and distracting lights. Brightened shadows, adjusted contrast on midtones and saturated warm lights using channels and luminosity masks. Enhanced the blue sky and fog towards the horizon line. Brightness, contrast, color, perspective and lens correction. Lightened shadows and color corrected the building in the center. Adjusted the color, saturation and contrast on the glass buildings and sky using Curves and Levels adjustment layers with masks. Sharpened the image using High Pass filter. Perspective and lens correction. Removed light pole in the middle and smaller poles in front of the building. Replaced and color corrected the sky. Brightness and color corrected the building, color corrected the grass and pavement. Cleaned and composited the lower right corner of the image. Sharpened and color corrected using luminosity masks, Channels and adjustments layers. Composited more fog in the distance. Perspective and lens correction. Removed people, tourist stand and color corrected the damaged red painted wood on the small tower in the front plan. Sky replacement. Color and brightness corrected the image using luminosity masks. Perspective corrected, expanded the floor space and reframed the picture. Removed surrounding environment reflections, chromatic aberrations and light leaks. Color corrected and enhanced the furniture while also adding sharpness and contrast using luminosity masks. Individually straightened the door, wall and makeup table. Removed black spots on the door, hanging paintings and carpet corner on the lower left side of the frame. Stretched carpet that’s in front of the bed to make the arrangement more even and the room more symmetrical. Reduced the horizontal folds to make it look more straight. Increased brightness and contrast using luminosity masks, color corrected image. Perspective and lens correction. Removed truck, puddles, trash, construction site and other distracting objects and lights. Adjusted color, saturation, contrast and brightness using luminosity masks and channels. Color and contrast correction. Removed fence and houses on the left side of the frame. Added fog behind the first hill and color corrected foliage and rocks in the landscape using luminosity masks. Sharpened image using a High Pass filter, adjusted overall light values and vibrance of the photo. Removed wires, small elements and patches of grass on the ground. Perspective corrected building and front monument individually and patched foliage. Brightness and color corrected the image using masks and adjustment layers. White balance correction. Perspective corrected building and centered it in the frame by patching right side of the image. Sky replacement. Removed people, paths, signs, center piece, staircase on the left, construction scaffolding and damaged roof parts. Brightened up the foliage seen in the window reflections. Increased the vibrancy of the foliage and increased the visiblity of light patches. Color and brightness corrected the entire image using luminosity masks and adjustment layers. Brightness, contrast, color, perspective and lens correction. Perspective corrected the reflection in the mirrors. Removed stains and scratches on the bathtub, mirrors, wood mirror frames and wooden floor. Removed pipes and left wall, and patched left curtain. Contrast and color corrected the image. Perspective and lens correction. Expanded the floor for reframing. Removed rolled carpet by the entry, trash cans, sockets, wall supports and sign above the entry. Brightened the exterior and color corrected the wooden ceiling and tables. Used a soft color palette from the same spectrum as the ceiling to harmonize the colors in the room. Color, saturation, brightness and contrast corrected the interior using luminosity masks and different adjustments layers. Disclaimer: Gallery created using mostly photos from Wesaturate and Retouching Academy Lab.